Welcome to one of our guest columns, where active researchers can share their views on topics relevant to materials science. Professor Geoffrey Ozin from the University of Toronto talks about why artificial photosynthesis is a goal and challenge and how nanochemistry can help. Discovering and understanding chemistry that enables the transformation of atmospheric O2 and N2 into useful materials has been an area of intense scientific and technological interest for more than a century. There have been numerous successes, perhaps the most notable of which are abiological mimics of nature’s hemoglobin (oxygen-transport iron-containing protein) and nitrogenase (nitrogen-fixation iron-molybdenum-containing enzyme), both of which serve to sustain life on earth, but there are still many natural processes that we are unable to successfully replicate in the lab, perhaps the most fundamental and challenging of which is photosynthesis. Nature’s photosynthesis apparatus housed in plants, certain algae and bacteria, utilizes atmospheric CO2 + H2O + sunlight to provide humanity with oxygen to breath, food to eat, and fuel to satisfy the world’s energy needs; however a catalyst that can produce fuel at a globally meaningful efficiency from sunlight and atmospheric carbon dioxide and water has not yet been discovered. The invention and development of a practical artificial photosynthetic machine is perhaps humanity’s most important 21st century grand challenge. To amplify in the context of learning nature’s secrets and transforming them in the laboratory into useful technologies, it is impressive that atmospheric CO2 can be so efficiently converted by plants into energy-rich sugars, yet efforts to devise similar reactions in the laboratory have had limited success. The driving force for accomplishing this is now greater than ever in the face of the present energy and climate crises, which threaten the very existence of humanity. Indeed the greatest mission facing humankind in the 21st century will likely be to discover a straightforward, scalable, safe, and cost-effective means to reduce our dependence on fossil fuels and to curb the release of greenhouse gases into our atmosphere from burning these fuels. Recall the old adage “nature did it first”; in the case of photosynthesis this is certainly apt with respect to the energy and climate problems facing humanity today. If we could learn how to mimic the way green plants make energy-rich fuels from CO2 + H2O + sunlight by inventing an artificial leaf made of earth-abundant elements that recycles atmospheric CO2 to energy-rich fuels at rates and efficiencies equal to or greater than photosynthesis and can be manufactured economically as solar fuel machines for integration into homes, buildings industrial plants and non-arable land, then we could be weaned off our reliance on fossil fuels that currently power our world and eliminate the negative effects of greenhouse gas emissions on our planet—sounds like a magic bullet! You can imagine this idea it not new and not surprisingly has grown in importance recently as governments around the world panic over the energy and climate crisis. In a valiant attempt to “save the planet,” billions of dollars are being invested globally on research programs and centers that purport to be working on artificial photosynthesis. It seems to me however, that much of the work in this area is actually focused on sunlight-powered electrolysis of water to create H2 as an energy-rich transportable fuel for making electricity, and, to the best of my knowledge, photoelectrochemical splitting of H2O into H2 and O2 driven entirely by sunlight does not occur in nature, but requires an additional fuel input (i.e., glucose), ultimately leading to the production of CO2 as an undesirable byproduct. This process occurs in certain species of algae and cyanobacteria under anaerobic conditions using the hydrogenase metalloenzyme, and its optimization through genetic engineering is actively being investigated. While these activities are undeniably very important and could help realize the dream of a green hydrogen economy, they differ fundamentally from the photosynthetic leaf where the only required chemical feed-stocks are CO2 and H2O, which is desirable both economically and environmentally as it consumes CO2 rather than producing it. 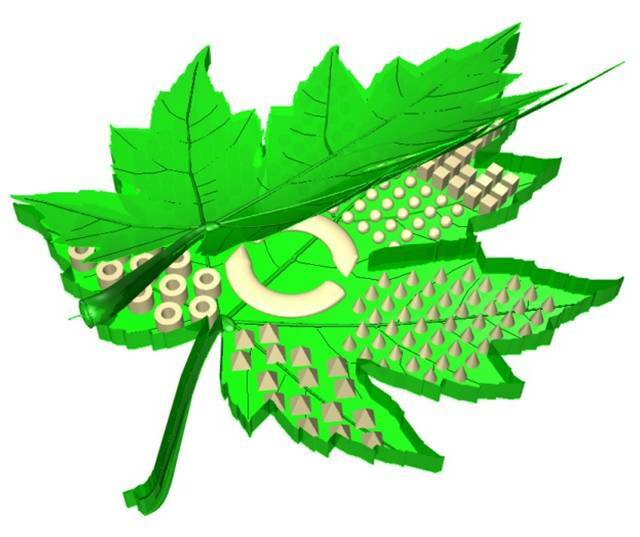 Surely nobody can deny that an artificial leaf able to conduct photosynthesis must at the very least have certain features in common with the natural leaf, such as its ability to efficiently trap, guide and absorb sunlight, successfully generate and separate electron–hole pairs, and effectively drive the multi-electron redox reactions responsible for the conversion of CO2 + H2O + sunlight into an energy-rich fuel. While we can learn much by understanding the scientific principles governing, the natural photosynthetic processes, without doubt a realistic mimic of the leaf is one that combines CO2 + H2O to make an organic fuel such as CH3OH rather than one that just divides H2O into H2. All we have to do is invent the right material with the right structure and the right properties to achieve this goal. Sounds simple enough, so why is it taking us so long? It’s all about designing and making the right photocatalyst in the correct form that exhibits sufficient reactant activity and product selectivity to do the task. This is not a simple problem to solve because management of the energetics and control of the dynamics of sunlight-generated electron–hole pairs have to be finely tuned through material composition and structural engineering to optimize multi-electron oxidation and reduction reactions of H2O and CO2 that underpin the formation of a specific organic product. This is where the strengths of a nanochemistry approach to nanoscale materials are likely to come into play, with all the advantages of synthetic control over their size and shape, bulk and surface composition, porosity and surface area, and their ability to self-assemble into constructions with structure, property and function relations designed to mimic the photosynthetic solar fuel machinery of plants as imagined in the graphical illustration of an artificial leaf made and powered by nanochemistry (see article’s main image, courtesy of Dr. Wendong Wang). If this could be accomplished at a globally significant rate at a globally meaningful scale and at a globally competitive cost, there would be nothing artificial about the magnitude of this scientific and technological achievement and humankind would be able to turn over a new leaf and enjoy the benefits of having learned from nature’s solar fuel factories a much better way to power the planet and keep it safe and clean!